So what is a mineral? Minerals are the small particles that you can see in most rocks. You can say that rocks consist of minerals, even though some rocks have more of them, while others have a few or none (these are glassy rocks but they are very rare). By definition, a mineral is a crystalline solid with a definite, but not necessarily fixed chemical composition. 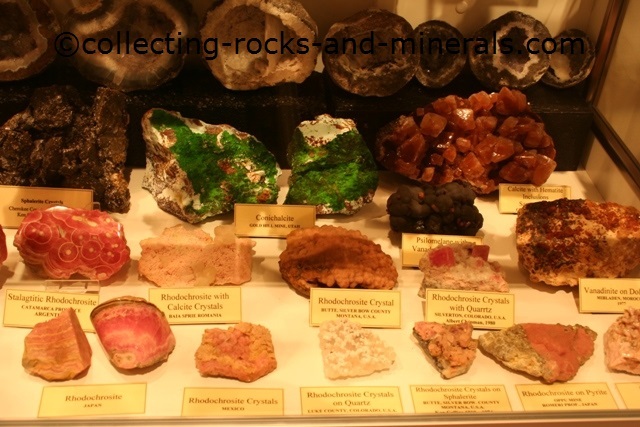 When we talk about minerals in geology we mean natural minerals - the ones that have formed naturally by different geological processes (which I will get to later on). There are, however, also synthetic minerals, which are manufactured. What does it mean that minerals are crystalline solids? It means that their crystals have got a repetative atomic order - their atoms and ions are arranged in a repeating pattern. What does it mean that a mineral has a definite, but not necessarily fixed chemical composition? It means that you can write a chemical formula for every mineral, but - within limits, the chemical composition can vary between different samples of the same mineral. In other times, it can be the other way around - there may be a few different minerals that have exactly the same chemical composition, but different other properties. Quartz, tridymite and christobalite for example have exactly the same chemical composition - they are all silicon oxides, but they have different crystal structures. Another confusion can be minerals like feldspars and micas. Geologists often use those terms to simplify things, but both micas and feldspars are not single minerals but groups of minerals. Return Home to Collecting Rocks and Minerals from What Is a Mineral?